whether one may like him or not, the World's most powerful person for four years running, Russia's president has exerted his country's influence in nearly every corner of the globe; from the motherland to Syria to the U.S. presidential elections, Putin continues to get what he wants. In 2016 Russian hackers were accused of tapping into email accounts owned by members of the U.S. Democratic Party in a bid to aid the campaign of Donald Trump, who has regularly praised Putin's leadership style. The Kremlin denies the charges, and President-elect Trump has also dismissed the possibility of outsiders tampering in the election. 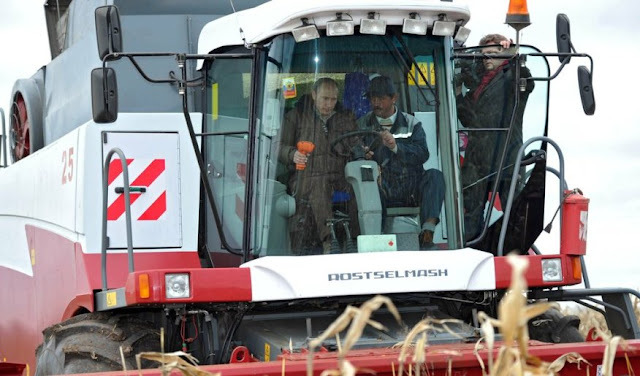 Now comes the news that Vladimir Putin visited an agricultural equipment factory — and quipped that if he were to lose upcoming elections, he might choose a new career in farming. 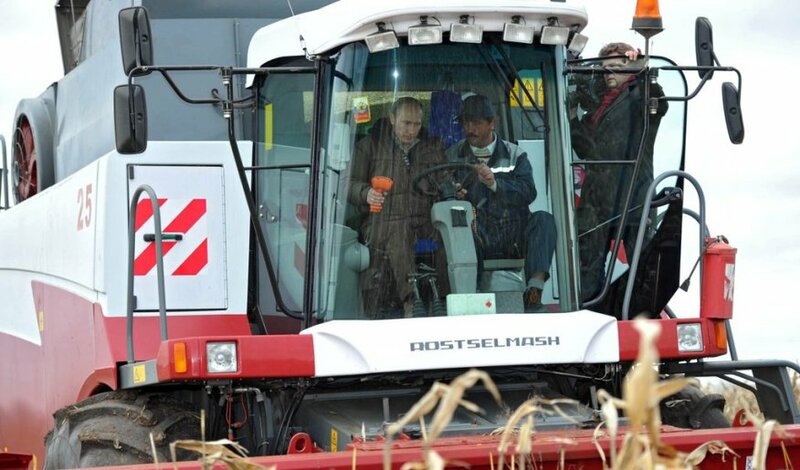 The Russian president reportedly made the comments while sitting in a combine harvester simulator at a Rostselmash factory in Rostov-on-Don. You may not have heard of ‘Volgograd’ ( an important industrial city and the administrative center of Volgograd Oblast, Russia, situated on the western bank of the Volga River, after which the city was named. You may recall it by connecting to a battle 75 years ago ! a battle often regarded as the largest and bloodiest battle in the history of warfare. The city’s origin may date back to 1500s ~ over years much water has flown on the river Volga. The city was renamed Stalingrad after Joseph Stalin in 1925. This was officially to recognize the city's and Stalin's role in its defense against the Whites between 1918 and 1920. Stalin is no longer a much sought name !! In 1961, Nikita Khrushchev's administration changed the name of the city to Volgograd ("Volga City") as part of his programme of de-Stalinization following Stalin's death, as he was trying to reduce the "cult of personality". To recall, Joseph Vissarionovich Stalin [1878 – 1953] was a Soviet revolutionary and political leader of Georgian ethnicity. Governing the Soviet Union as its dictator from the mid-1920s until his death in 1953, he served as General Secretary of the Central Committee of the Communist Party of the Soviet Union from 1922 to 1952 and as Premier of the Soviet Union from 1941 to 1953. The Battle of Stalingrad (23 August 1942 – 2 February 1943) was a major confrontation of World War II in which Nazi Germany and its allies fought the Soviet Union for control of the city of Stalingrad (now Volgograd) in Southern Russia. Marked by fierce close quarters combat and direct assaults on civilians in air raids, it is often regarded as the single largest (nearly 2.2 million personnel) and bloodiest (1.7–2 million killed, wounded or captured) battles in the history of warfare. It was an extremely costly defeat for German forces, and the Army High Command had to withdraw vast military forces from the West to replace their losses. The German offensive to capture Stalingrad began in August 1942, using the 6th Army and elements of the 4th Panzer Army. The attack was supported by intensive Luftwaffe bombing that reduced much of the city to rubble. The fighting degenerated into house-to-house fighting; both sides poured reinforcements into the city. By mid-November 1942, the Germans had pushed the Soviet defenders back at great cost into narrow zones along the west bank of the Volga River. By the beginning of February 1943, the Axis forces in Stalingrad had exhausted their ammunition and food. The remaining units of the Army surrendered bringing to a close the battle that had lasted more than 5 months. News from Russia state that Russia marked the 75th anniversary of the victory of the Battle of Stalingrad which ended in 1943. The battle lasted 200 days and became a turning point during World War II as the Nazis were defeated. President Vladimir Putin attended several ceremonies in Volgograd .. .. the German defeat in the 200-day long battle was a pivotal moment in the war and is glorified by Russia as the event that saved Europe from Adolf Hitler and as a symbol of the country's resilience. Putin flew to Volgograd, the current name of the city, where he laid flowers and a wreath at the city's war memorial Mamayev Kurgan, as well as posed with a group of young women dressed in historic World War II-era uniforms. 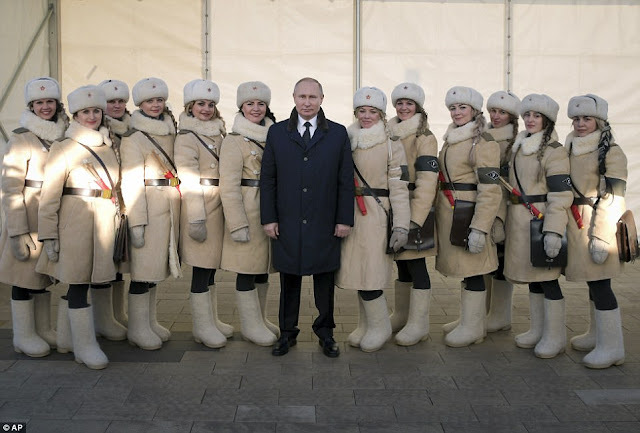 He posed for a picture alongside women dressed in historic Red Army uniforms during commemorations of the 75th anniversary of the Battle of Stalingrad. He also attended a military parade in Volgograd, involving about 1,500 troops, armoured vehicles and jets flying over a crowd of spectators bundled up to protect against the sub-zero temperatures. 'There was no other such battle in the history of mankind,' Putin told a crowd of veterans he met at the Volgograd philharmonic for a concert commemorating the event.